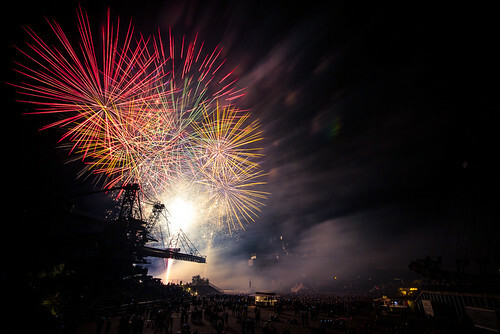 Each Summer over in Germany, the skies above all the major cities are treated to a number of firework competitions, some of which like the Herrenhausen Gardens, include international Firework Company teams of professionals, whereas the Duel Der Feuerwerker (AKA Pyro Games) are exclusively for the homegrown teams to show their talents. The events are held across Germany throughout the summer with the first event on 23rd June and the last one is 4th November 2018. Over the years, the event has grown and grown and includes a great deal of other entertainment before the fireworks, including a full menu to have dinner and there are lots of pyro related acts showing their expertise at one or more of the venues on offer. Last year, included a fantastic light and laser show from Jurgen Matkowitz’s Apollo Art of Light and Fire thousands of colourful and beautiful laser beams are cast across the skies above the spectators as well as Freaks On Fire who are pyrotechnicians who literally play with fire. This extreme team of fire lovers have finely honed their skills as they manipulate fire; twirling, fire-breathing and fire eating to list just a few all choreographed into a breath-taking show combining pyro and dance. Get ready to see firsthand swinging Poi (a traditional Maori performing art where two arm length chains or leads with a handle attached with a mesh cage packed with burning materials which are swung around) fire sticks and fire knives. All of the additional entertainment, of course, is there to motivate the spectators before the main event begins. At each event, there will be 4 professional teams from across Germany competing against one another for bragging rights. Overall, the event is a competition with a difference and as all are held at different stadiums, outdoor arena’s and one is even held at a movie park. The prices will change depending on whether you want a front row seat or indeed wish to include dinner as well so check the site out for more details. Whichever event you are able to get along to, it is certainly going to be bright, beautiful and a mind-blowing event for all the family to enjoy.